Your data is like your business blood: It must be protected at all costs. That's why it's a good idea to safeguard your most important data, to back it up in case of disaster, to password-protect it in case of loss or theft, and to destroy it when it's no longer wanted. Vitarsoft's File Secure Free takes a four-pronged approach to data safety. This utility can create a simple backup, encrypt selected files and folders, password-protect an external drive, and shred unwanted files so they can't be recovered. That's an impressive roster of capabilities for a freeware utility. There are other products that can handle similar tasks, but most of them tackle only one. Here you get four important and useful functions under one software roof. And what a refreshingly simple roof it is. When you launch File Secure Free, you'll immediately see its four functions in tabbed selectors on the left. Pick the one you want, then perform the designated activity. Things work similarly simply with File Encrypter, File Shredder, and Lockup. This last lets you choose a drive volume to password-protect, then requires entry of that password to access the drive. It couldn't be much easier. 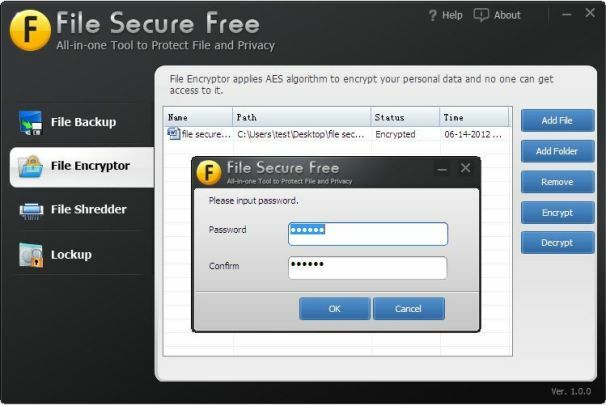 Although it lacks more advanced features like incremental backup, File Secure Free manages to be pretty robust when it comes to security, offering your choice of five proven file-shredding techniques and military-standard AES encryption. In short, this is a great tool for users who want solid, straightforward data protection but don't want to invest any money into it.